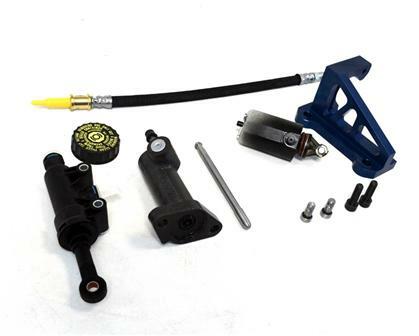 If the hydraulic assist on your factory Porsche 996 Turbo or X50 is giving you trouble with racing through the gears, then you might want to check out this new product from Agency Power. The GT2 slave conversion kit gets rid of the hydraulic assist to give your clutch pedal a stiffer more responsive feel to it. The factory slave does fail sometimes so this product can serve as a replacement or an upgrade. The kit includes a CNC machined aluminum bracket that fits on top of the transmission to mount the new components. In addition, a shorter rod is included which keeps the pedal travel limited yet still offering a comfortable daily driving machine. New OEM Porsche parts are included to replace the existing hardware. The blue anodized bracket is mounted on to the transmission which requires it to be removed from the vehicle.